What digimon would you choose if you were given the chance to.. If any Digimon? I'm old school: Agumon all the way! Or Diaboromon. Under my control. Mwuahahahahaha! 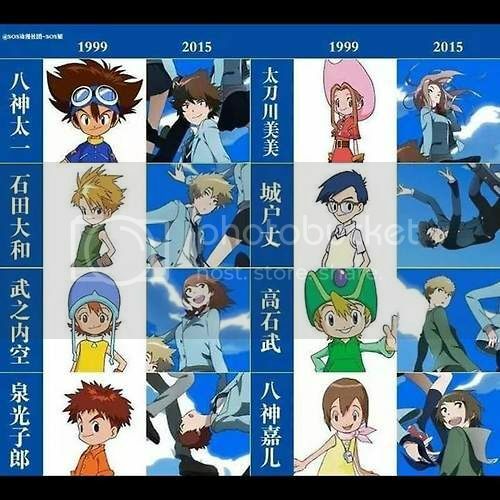 But taichi is 17 in this upcoming series and in 02 he was in middle school so its most likely the events after 02. I don't mean to break your heart again but, taiora was never intended from the beginning. Heres the post i made. gGUYS GUYS SOME GOOD NEWS AFTER THE kitten NARUTO ENDING. SILHOUETTES OF THE ORIGINAL 8 I'M SCREAMING!!! MY OTP ARE NEXT TO EACH OTHER TAKARI!!! You can tell who is who. The order is Joe, T.K., Kari, Tai, Matt, Sora, Izzy, and Mimi. Actually the rumor going around from a leaker is that this story is going to ignore 02 and the 02 epilogue. So Taiora and Takari still have chance. A hacker hacked the website, and found the data for all the 8 original children but none for 02, nor are the digimon from 02 being promoted. Seems like this may actually be legit. I hope it is because I hated many parts of 02 and especially that awful epilogue. So here's hoping they've done away with it. Be mindful that this leaker was the first one to leak the silhouettes so they could very well be legit. Edited by Geninja, 09 November 2014 - 01:11 AM. Location:Lol. You don't need to know. Interests:NaruSaku(Duh),Drawing, Video Games, Sakura, Naruto, Kakashi, Lee, Earthbound. Digimon is coming back!? YES! Finally, some good news! Take a melody, simple as can be. Give it some words and, sweet harmony. But, even I thought TK & Kari would end up together. I was shocked when they just got with random people. The death of one ship, while the original ship is reborn. This is Taiora, and I'm your captain - Greed. We're probably going to get sunk again, but I'm climbing aboard anyway! There is nothing that'll sink this ship. Not this time. I've prepared. What about the children of hope and light? I mean they were freaking prophesized by Azulongmon to be the keepers of the digital world. They seriously were soulmates. Here's hoping they get them together, because as an 8 year old I got ticked when I found out that they did not end up together or at the very least they didn't tell us. Even though there kids look freakishly alike. gGUYS GUYS SOME GOOD NEWS AFTER THE sh*tty NARUTO ENDING. They do indeed look different, the style is more like the movies, not the anime. I'm alright with how they look, but again the animation for it is different. I'm not too excited on Tai though, maybe it's just the angle, but he looks off to me. Also Kairi and Sora have the same face XD but I do like how Mimi and Joe look. So, what do you all think? Edited by Konohakitten, 15 December 2014 - 05:36 PM. Meh, if the pairings keep being the same, then this new series will be nothing but wasted potential. I was never too hot about the animation style from the old series, so this one is an welcome change. I hope they ditch the S2 characters and focus on these ones. I have nothing against them, but I never really felt the need for an new generation.